Being roughly 4 times less busy than Moscow’s Sheremetyovo and 6 times less busy than New York’s JFK, Borispol was a reasonably efficient airport. A mere 30 minutes after landing, I had already cleared security and picked up my suitcase. Once I’d stashed said suitcase in the baggage room, I hopped in a taxi. Another 30 minutes and I was in central Kiev, cool as a cucumber and ready for lunch. Aaah, Odessa: the legendary Potemkin Stairs, the mail-order brides, the mafia… and the Privoz Market. The Privoz was created in 1827, originally as a handful of horse-driven carts next to the older Stary bazaar. As more buildings were constructed, it slowly became the largest food market in Odessa, and it remains so. Don’t expect any neoclassical splendor like Saint-Petersburg’s Gostiny Dvor, however. Privoz nowadays is a chaotic, busy market that sells food, clothes, and everything else, in a maze of outdoor food stalls and covered halls that won’t impress you with their architecture. What might surprise you, though, is the variety of food on display. Especially seafood. Dishes that come to mind when you think about Ukrainian cuisine, provided you don’t draw a complete blank, probably include various dumplings, potatoes, sausages, the famous borscht and other vegetable soups, or the ubiquitous-but-not-truly-Ukrainian Chicken Kiev — meat and produce, essentially. And like any other food market, Privoz sells its share of cabbages, cauliflowers, potatoes, tomatoes, cucumbers, eggplants, zucchinis, and peppers. There’s an entire hall for butchers, although zealous security guards strictly enforced the no-pictures policy when I was there. Anyway, the truth is that the vendors offered a good but expected selection of meat; I didn’t see anything extraordinary. This was no Uzbekistan. The fruits looked just as familiar — what do you expect? Here are enough blueberries (from Northwestern Ukraine, apparently) to re-try all of my preserves, jam, and pie recipes combined. These small shrimp are typically eaten whole, with or without a skewer. They’re also used to stuff fish fillets, or in juliennes, which in Russian doesn’t designate a special way to cut vegetables, but an au gratin dish with mushrooms, meat or seafood, cream, and cheese. Then there’s the salted fish — lots of it. Here we see some vobla (aka Caspian roach) from Astrakhan, cured with the roe still inside the fish; taran (which is pretty similar I think); and lesch, freshwater bream. There’s also a wide variety of small fish: Danube herrings (aka dunayka), gobies (a fish found all over the world but of commercial importance mostly in Ukraine), sardines (“for cutlets”), and anchovies (“tasty, fatty, super!”). The most inspiring fish I saw at the market was the highly prized turbot. The refrigeration method was a bit questionable (what’s the temperature of the parts of the fish that are not covered with a piece of ice, at noon in the summer? ), and I’m intrigued by the numerous little bumps on the skin (caused by barnacles), which I’ve never seen anywhere else on fish of comparable size. Still, with its firm flesh, large flakes, and delicate flavor, turbot is the darling of many Michelin-starred restaurants. Heston Blumenthal uses it to make his “perfect fish and chips” in In Search of Perfection. Its trimmings are among the best choices when making fish stock. In Ukraine, turbot is likely to be prepared in a simple way, baked or fried, with the usual garnishes including gherkins, horseradish, tomatoes, carrots, apples, cabbage, buckwheat, mushrooms, or potatoes. If the nearly non-existent refrigeration is a problem for you, there’s the ultimate fresh option: live fish, kept in tanks, netted and cleaned to order! Unfortunately, I can’t tell you what kind of fish we’re talking about… But if you’re looking for more pictures of the seafood at the market, check out this website. Among other things, you’ll see some carp, catfish, Caspian sprat, and garfish. Privoz also inspired a lot of food-related jokes. Here are a couple to finish our tour! – Son, is your fish fresh? – Of course it is, it’s still alive! – Buy some fresh fish, sir! – Is it really fresh? – What a question! Just came out of the sea. – Why are its eyes closed? Is it sleeping? And why does it stink like that? – Listen, sir, do you control yourself when you sleep? Last summer, after touring Moldova, we crossed the border with Ukraine and headed towards Odessa. 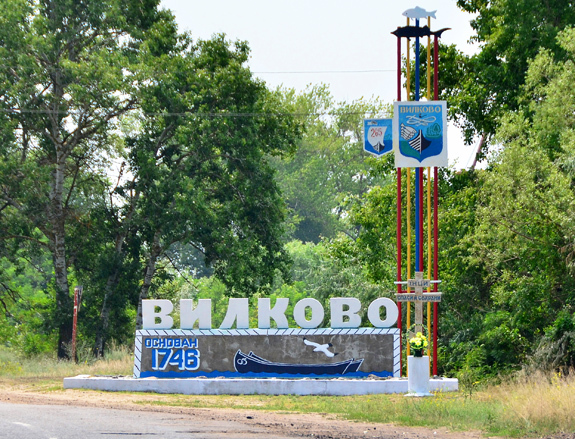 The goal wasn’t really Odessa itself, which I had already visited, but a remote village called Vylkove (Vilkovo, in Russian). Vylkove takes its name from vilka, which means fork, on account of its location in the Danube Delta. 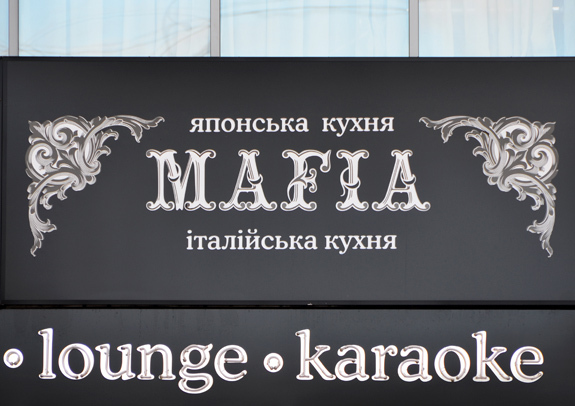 Although the town is nicknamed “The Venice of Ukraine”, you’d have to be blind or seriously drunk to confuse the two. Don’t expect any sumptuous palace, carnival, or herds of tourists; Vylkove is just a little fishing village. Today I’m starting a new travel series: Ukrainian Snapshots. I’ve been to Ukraine many times over the past ten years. Back in the days before Aerosvit went bankrupt, the New York-Kiev direct flight was a convenient and reasonably affordable option whenever I planned to visit the former Soviet Union. Before the opening of its new terminal, Moscow’s notoriously disorganized Sheremetyevo did not have a transit zone and therefore required going through the masquerade of the visa process (until recently, your typical Russian embassy/consulate was a kind of cour des miracles where aspiring tourists proffered fake invitations, bogus travel insurance, variable amounts of money, and countless hours of their time to a grumpy and/or corrupt clerk, all to receive a piece of paper pompously called a visa). By contrast, Ukraine could be visited without a visa, and little Borispol is 30 minutes away from Kiev’s center (no contest with the 1-2 hours it takes to get from the airport to the city center in Moscow). For this reason, and also because some of Ukraine’s less touristy destinations are more conveniently accessed from neighboring countries if you happen to already be visiting them, many of my trips to Ukraine were quite short; a couple days here and there. My last week-long trip actually goes back to summer 2006 (Crimea). So instead of presenting my Ukrainian travel stories in any particular order, I’ll focus each of my posts on a given place and point in time. As usual, don’t expect me to review many mainstream touristic curiosities — this is not a travel guide. I might also start another travel series in parallel. After all, with Ukraine International Airlines recently reviving the New York – Kiev route, there might very well be more snapshots to come in the future. 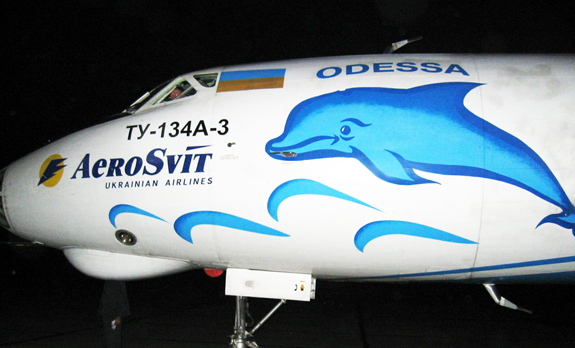 I’ll kick off this series with an anecdote: the Kiev-Odessa flight and the Tupolev 134. This may not have anything to do with food, but it sure qualifies as an adventure.